It’s incredibly cliché but, let’s face it, there just aren’t enough hours in a day—especially if you’re a cigar enthusiast. Between work, commutes, kids, errands, three square meals, taxes, and all the other responsibilities us grown-ups shoulder, how exactly is a human supposed to set aside an hour (more reasonably, 90 minutes) to enjoy some premium tobacco? The older I get, the harder it gets to find the time. Not only do the days, weeks, months, and years seem to get shorter, but there’s just so much more going on in my life. My job is more demanding. I travel more frequently. And, most importantly, I’m now responsible for the upbringing of two small people I helped make. I would imagine many of you can relate to this (albeit blessed) conundrum. But we must find the time. We must smoke cigars, even if it means waking up 90 minutes earlier and/or staying up 90 minutes later. We must overcome obstacles like temperature, smoking bans, and—the hardest hurdle of all—the finite number of minutes in each day. I need my regularly scheduled cigar. Not because I’m addicted to the leaf (unlike cigarettes, I don’t know one cigar smoker who has a physiological dependency on cigars), but because I need to unwind. I need some quiet moments when I can kick my feet up and relish in the aromas, flavors, sights, and sounds of an impeccably made cigar. I notice many people choose to pair up cigar smoking with another activity, be it golf, driving, walking, or whatever. 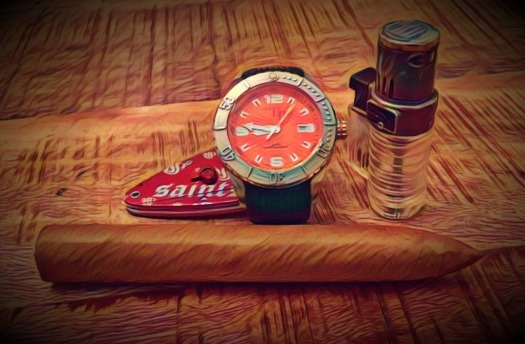 Some are probably just trying to cram a cigar or two into their busy schedules; others might proactively prefer to not make the cigar the centerpiece of any given experience. Personally, I’ve always found the best way to get the most out of a cigar is to put the rest of the world on hold and just sit down and smoke. Finding the time to do so is the tricky part. Speaking of time, be sure to take your time while you smoke. Smoke slowly. Cigar enjoyment is not a race, and there’s no prize for finishing first. Besides, in order to “cook” the tobacco at the right temperature, you should try to limit your puffs to a reasonable pace. When you puff you’re caramelizing the sugars in the tobacco to bring out the flavors. If you puff too often, the temperature will rise, the tobacco will cook too fast, and the smoke may get hot and harsh. I find this is especially true with full-bodied smokes. I can’t tell you how many times I’ve seen someone sucking down a ligero-laden cigar like it’s going out of style. I can’t imagine that’s enjoyable. Most things, cigar smoking included, aren’t nearly as pleasant if rushed. My advice? Carve out some time to smoke a fine cigar and, when you do, make the most of the experience by taking your time. Never multi-task when I have a cigar. But the window of opportunity closes quickly. It helps though if your spouse understands the requirements and helps you get there. I am one of the lucky ones.